Experiencing good days with good friends! The Day Services Clubhouse program supports young adults with developmental disabilities to gain the confidence and independence needed to lead more productive and active lives. 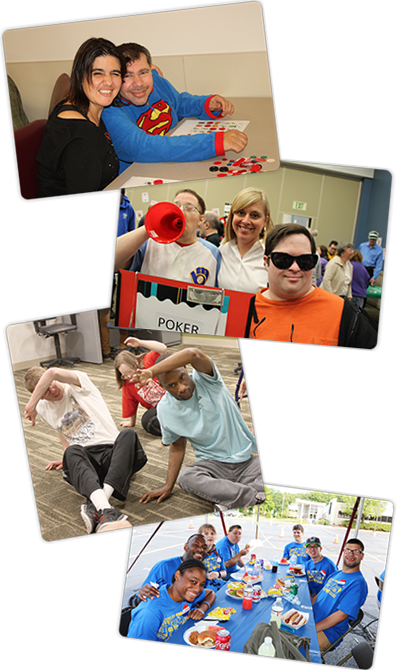 Goodwill operates two centers that develop and provide activities based on individual interests and needs. Whether they are working part-time or just looking for a more active lifestyle, our participants may choose from a variety of classes and opportunities to improve life skills through recreational and social activities, health and wellness activities, arts and enrichment classes, community outings and volunteer opportunities and vocational exploration. This personal, engaging approach provides a foundation of skills, confidence and self-awareness that better prepares participants for life and work in the community. Recreation and social activities such as playing cards, enjoying sports or exercise, arts and music appreciation, parties, using computers and spending time with friends. Community outings such as trips to restaurants, museums, fairs and festivals, parks, shopping malls, movie theaters and concerts. Community integration such as volunteer opportunities, community and vocational exploration. Supportive learning environment with opportunities to build new skills while maintaining present abilities in mobility, communication, academics, self advocacy and independent living. Case management to assess your service needs, monitor your progress and provide counseling and guidance. Trained staff dedicated to providing you good days with good friends. Have an interest in developing life and work skills and increased community opportunities with a desire to be as independent as possible. Do not require any skilled nursing assessment, observation, or care. Need minimal or no assistance with daily living skills. Do not pose any safety risks to self or others. To make a Referral: Contact our Intake Coordinator at (855) 455-1110 to make a referral or for more information. While hours of operation vary slightly by location and service, most Day Services programs operate Monday through Friday between the hours of 8:00 AM to 4:00 PM. Goodw ill Day Service programs are CARF International accredited.This dedication to service excellence, processes, and continual improvement helps ensure the highest quality of program delivery.